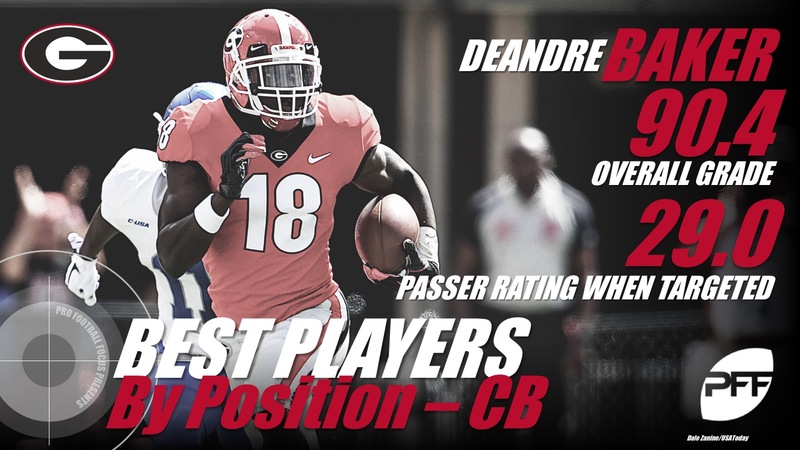 We’re now well into the 2018 NCAA football season and some of the nation’s best are sifting to the top of their respective positions. 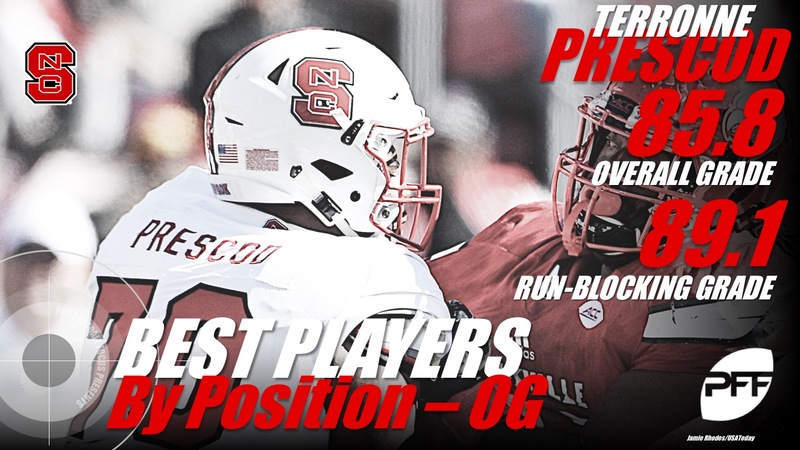 With our proprietary grading of every player on every play of every game at the FBS level, we’re in a unique position to be able to highlight not only those players who dominated on a weekly basis but also those who have now shown up for their teams week in and week out. Grier has made every throw this season, leading the nation with the highest percentage of positively-graded throws while ranking seventh in big-time throw percentage at 8.3%. He ranks sixth among Power-5 signal-callers with an adjusted completion percentage of 78.4% and he’s tied for third with seven touchdowns on deep passes. 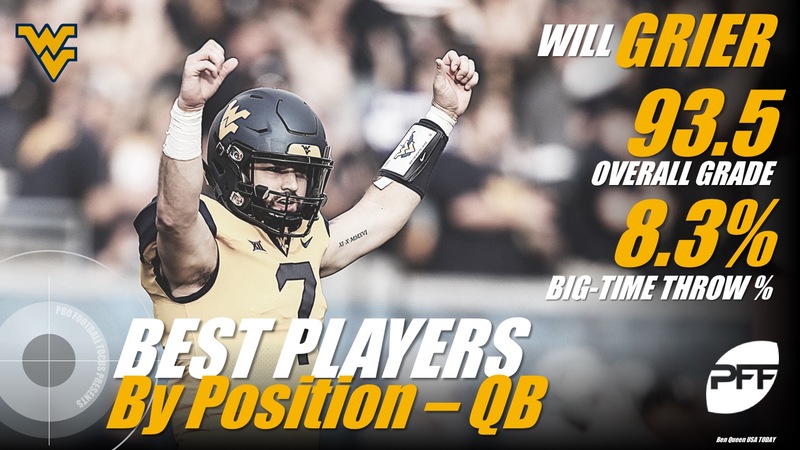 Grier has shown impressive accuracy to all levels while posting one of the lowest percentages of negatively-graded throws in the nation, all leading to the top overall grade among quarterbacks in a tightly-contested early-season race. The raw stats look fake as Henderson has rushed 65 times for 760 yards, good for an incredible 11.7 yards per attempt and a gaudy 7.5 yards after contact per rush. He’s forced 19 missed tackles on 65 rushes and he’s been just as effective in the pass game with eight catches for 171 yards and two scores, leading to a strong 79.6 receiving grade. 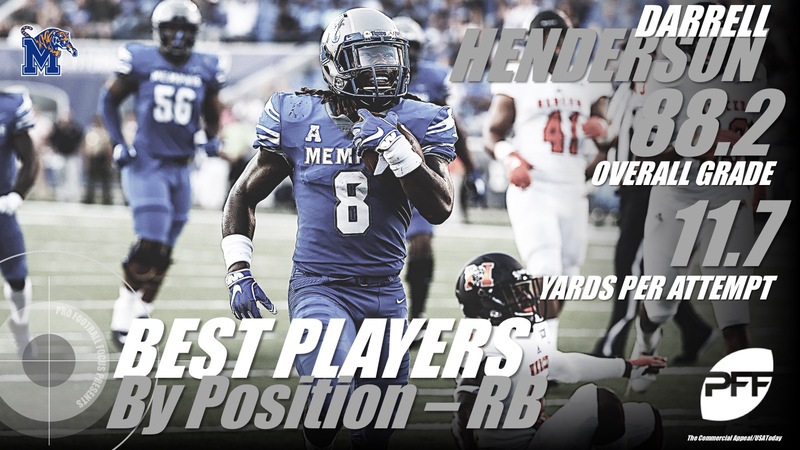 Henderson’s all-around game has him sitting atop the running back rankings through five weeks. 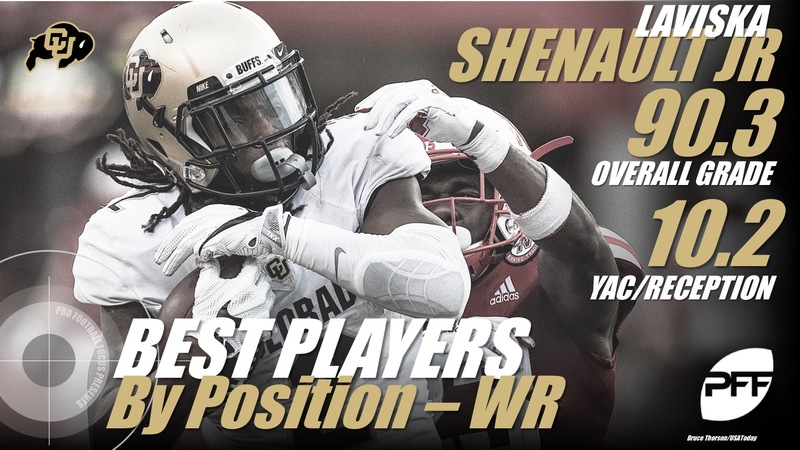 One of the biggest breakout players of the season, Shenault ranks fifth in the nation with 589 receiving yards, but he leads with 399 yards after the catch, averaging 10.2 YAC per reception. 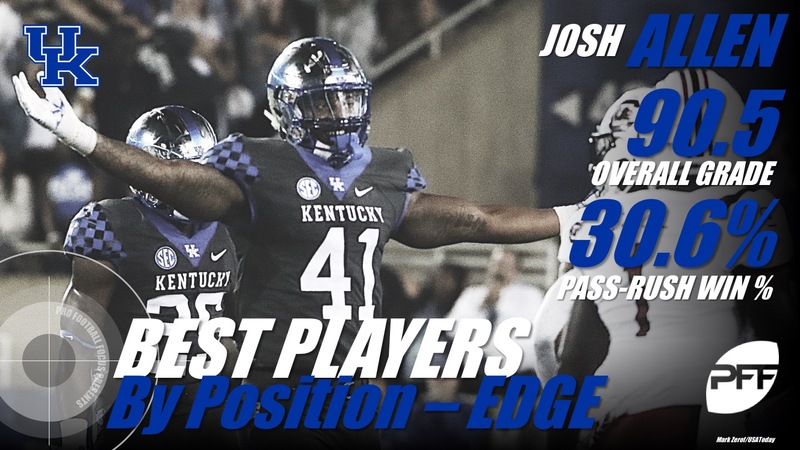 He’s become one of the best mismatch weapons in the country as he lines up all over the formation including 222 snaps at outside receiver, 114 snaps in the slot, 46 as an inline tight end and even 13 as a running back or wildcat quarterback. Coming into the season, Brown had only played 198 snaps over the last two years at Oklahoma State, but the grad-transfer has broken out as one of the nation’s best playmakers on his new team. He ranks third among tight ends with 19 receptions and he leads the way with 176 yards after the catch per reception (9.3 YAC/reception). Brown’s after-the-catch work has dwarfed all other tight ends as he’s forced nine missed tackles as the next closest tight end only has four. 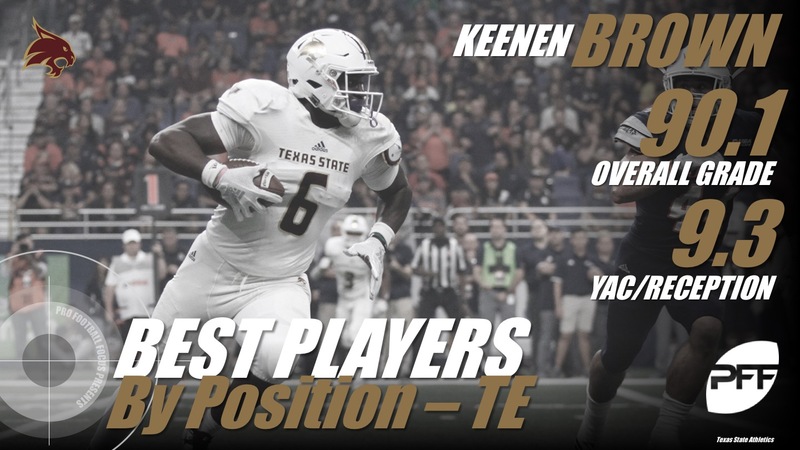 He’s also been more than just a receiver as he’s posted a strong 74.9 grade as a run-blocker, fifth-best in the country. Our No. 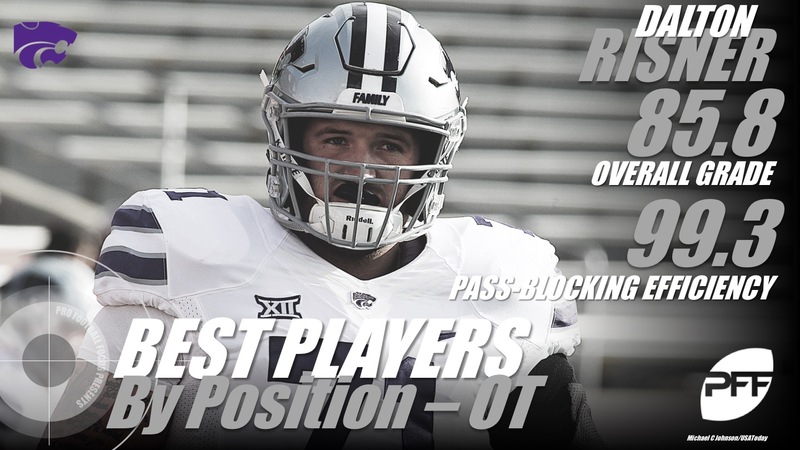 10 player in the nation coming into the season, Risner has lived up to the hype as the best tackle in the land. He’s allowed just two pressures on 163 snaps in pass protection, ranking eighth in the country with an 89.1 grade as a pass-blocker. Risner has also done his usual fine work in the run game with a 78.2 grade. Prescod has allowed only two pressures on the season, leading to the No. 4 pass-blocking grade among guards at 90.9. He’s also posted the top run-blocking grade in the nation at 89.1, including the highest percentage of big-time blocks among guards. 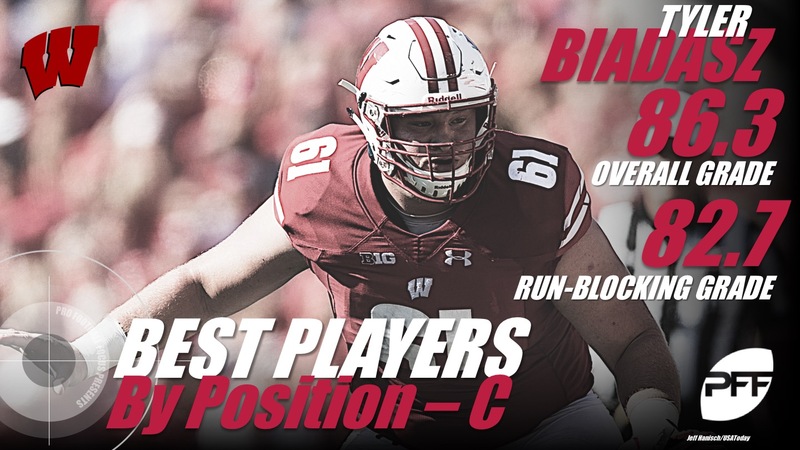 That nation’s top projected center coming into the season, Biadasz has continued his strong play while allowing only three pressures and ranking second among centers with a run-blocking grade of 82.7. With Ohio State’s Nick Bosa going down due to injury, Allen takes over as the top-graded edge defender as he’s elite play has helped to lead Kentucky to their undefeated start. Allen has the top pass-rush productivity in the nation at 21.6, notching six sacks, seven QB hits and 16 hurries on only 111 rushes. His win percentage of 30.6% is also best among the nation’s edge defenders and he’s been strong against the run with an 82.8 grade. 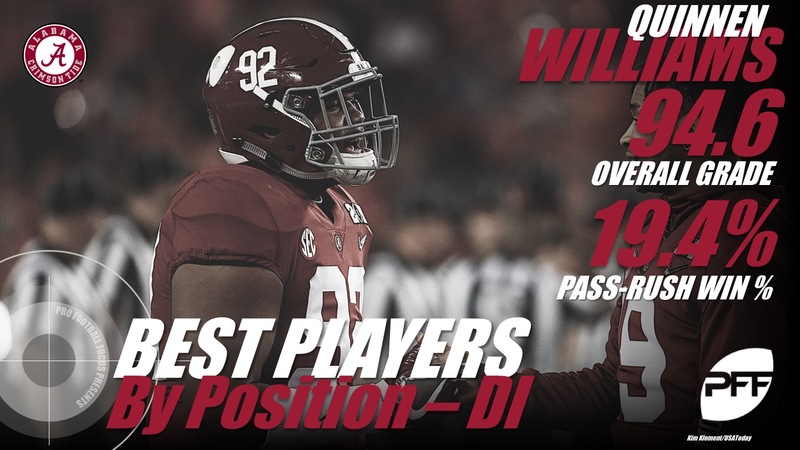 One of Alabama’s newest stars, Williams has been the nation’s most disruptive interior defensive lineman. He has the No. 3 pass-rush grade at 90.0, picking up five QB hits, 12 hurries and a batted pass on 98 rushes while ranking third among interior defensive linemen in pass-rush win percentage. Williams has done his best work in the run game where his 95.3 tops all defensive players in the country and his run-stop percentage of 19.4% is the nation’s best among interior defensive linemen with at least 50 snaps against the run. 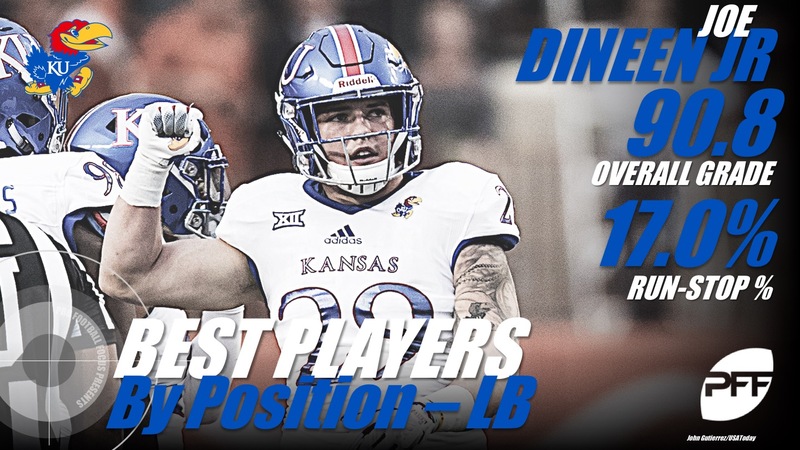 Dineen narrowly edged out a number of other linebackers and he’s done his best work in the run game where his 91.2 grade is tied for sixth in the country. He ranks third in run-stop percentage at 17.0% and he’s missed only three tackles on the season. In the passing game, Dineen has added five pressures and he’s posted a solid 78.5 grade in coverage. The No. 7 player and top cornerback on our PFF College Top 50 coming into the season, Baker has been outstanding through five weeks, allowing a passer rating of only 29.0 into his coverage. He’s been targeted 20 times, allowing 12 catches, but for only 79 yards while intercepting two passes and breaking up five more. 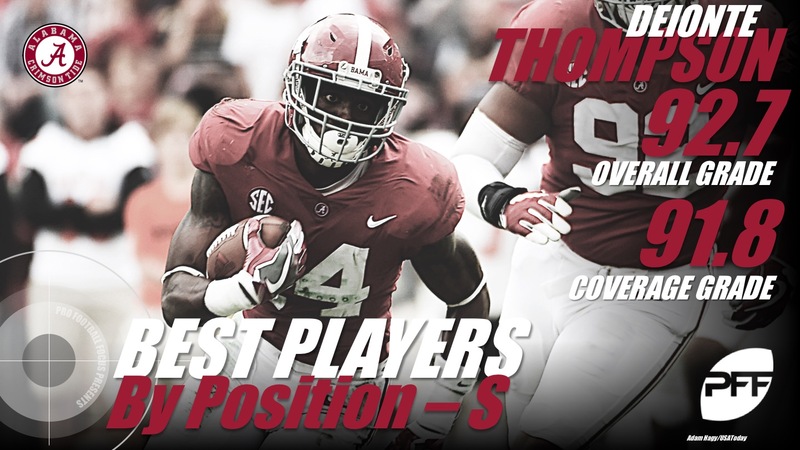 Another breakout star on Alabama’s defense, Thompson has shown incredible playmaking ability already this season. He has the nation’s top coverage grade at 91.8, allowing only 5-of-14 passes to be completed into his coverage while picking off two and adding four pass breakups. Perhaps most impressive about Thompson’s game has been his ability to make an impact in multiple roles, from center field safety, to playing in the slot, to lining up in the box.